When she was a child her father bought her a beautiful red address book and Doris faithfully kept a note of the addresses of those who crossed her path throughout her life. At the grand old age of ninety-six it is sad but perhaps not wholly unsurprising that many of the names in the book are crossed out with the word ‘dead’ written against them. The Red Address Book tells the story of one woman’s rich life honing in on some of the names and addresses held within the address book. Doris lives in Stockholm and her only living family is Jenny, her Grand-Niece and her family, who live in America. Doris is not doing so well and has devoted some of her waking hours to penning the story of her life to Jenny, to keep those names in the address book alive. I loved this book, the tone spot on for an elderly woman who has lived, loved and made good choices, and bad, and learn to live with them. I know I sound old myself but it is simply so refreshing to read books about people of this generation before everyone had to be a victim of something or another. Here we have some of those old-fashioned qualities that if I were Prime Minister I would insist were some sort of rite to becoming a fully-fledged adult. Doris has lived. After the death of her father she was more or less pushed out of the home by her mother to go and earn some money as a maid. Did Doris dwell on this rejection for the rest of her life? Did she hell! She recognised the hurt it caused at the time, and moved on treating it as a passing incident in her life, her springboard to becoming a living mannequin in Paris, rather than a hurt to be nursed for her remaining eighty odd years. During the course of the book we see Doris face a multitude of situations as she criss-crosses between countries, lives through a war, heartbreak and more and each one is faced square on, no matter what. In conjunction with these adventures, Doris is portrayed as a ‘real’ woman, she is unwilling to do exactly what she is told by her caregivers and hospital staff, if it doesn’t make sense to her. After all this is a woman who has mastered skype to keep in touch with her family, she does not need to be told when to go to sleep as if she was a child! But at the same time she is accepting that her end is coming near and so is portrayed as a mixture of toughness and vulnerability or in other words like a real woman who has lived a full life. I did have a lump in my throat towards the closure of this book although I’m pleased to report that it didn’t have the feeling of overtly playing with the emotions and nor did we have the stereotypical cantankerous elderly woman instead we have a thoughtful piece that will invariably cause its reader to recall many of the paths that have crossed their own, briefly or otherwise, and for whom few will be recorded in our lives particularly with the demise of written records. 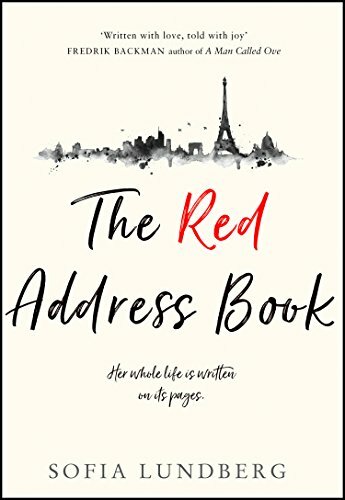 I’d like to say a huge thank you to the publisher HarperCollins UK and the Sofia Lundberg who allowed me to experience some of the highs and lows of Doris’s life by allowing providing me with a copy of The Red Address Book. This review is my unbiased thanks to them. Oh that is good news – I hope you enjoy it as much as I did! Just began reading this last night. Looking forward to getting to know Doris. Lovely, thoughtful review. Lovely review, sounds like my kind of book! This sounds so good, I’m adding it to my TBR. I’m so glad you liked this so well, Cleo. I thought when you first mentioned it that it was a fascinating way to tell a life story. And people’s narratives are such good ways to tell about larger events, too. It sounds as though that’s what happens here, and that’s great. I’m going to have to put this one on the wish list! I love this review! And I intend to try the book. Love how you shared that this woman faced things and didn’t let the trials of her life dictate who she should be and how she should live forever. A good thing to emulate. There’s a lot of grit in that generation – the era that both my parents were born into. Sadly, that generation is fast leaving this earth and I hope that we who are left can retain some of their good behaviors (while casting aside some of the bad ones). This sounds beautiful – as was your review! I definitely want to read this book! I also love the cover of it, how simple it is. Great review, Cleo, and I am just starting this book, definitely looking forward to Doris’s experiences. I’m not quite at her age, but I can feel the time ticking a little, with many more years behind than ahead. I can relate, in that sense, and I want to savor Doris’s way of looking at her life. Thanks for sharing. I just put a reserve on this one from the library, I think it’s a one I’ll like a lot. Thanks for sharing. What a story that address book could tell. I still have a physical address book, but I don’t keep up on it like I used to. This sounds really charming Cleo with a fantastic lead character. The idea for this is so imaginative! I’d love to read it and thanks for your wonderful review! I think it makes a refreshing change!